Are We Reaching Satellite Saturation Point? We all like our satellite navigation systems and mobile phones, Google maps and BBC World when we find ourselves in hotel rooms, but a report just published by the US National Research Council claims that we are on the brink of clogging up space to the point of no return. A couple of years ago 2 satellites collided destroying both of them, one had already been decommissioned but the other was a communication carrier that was still in use. Also recently, astronauts had to get in to the emergency escape capsule on the International Space Station as debris passed close by. There are about 22000 big pieces of debris floating round the Earth and many more smaller but potentially equally damaging pieces, and the problem is the lack of international agreement upon the use of near space. Almost everything from Sputnik onward is still floating about up there. The Chinese military destroyed one of their disused military satellites in an experiment in 2007 but that just created thousands more potentially dangerous pieces. More of a political action than a potential solution. Now maybe we can live with the odd collision now and again, but a related and really serious problem and the underlying cause, is our reliance on this technology. Scientists talk about potential damage from solar flares and the likes, that might even knock the entire system out for an undefined period of time. This would have catastrophic effects on the world, no Satellite navigation means no aeroplanes, ships navigating by the stars, emergency services having to rush out and buy maps of the city, UPS and their competitors losing their way, and even worse than all this Sainsbury’s not being able to deliver Mrs French’s vegetables on time. Easy to take lightly but really quite a serious problem. Dependence is a difficult thing to overcome, but scientists are experimenting with bringing old satellites back to Earth. A sort of Kite is being trialled that once attached to its objective slows it down so that it enters the atmosphere and burns up, but this must be seen against a backdrop of more satellites being launched every month. They are both commercially and militarily extremely important. Who has the right to govern space though? Competition rules and it is big business. For a more detailed incite have a look at these postings on the Bassetti Foundation website. I don’t understand why we can’t just blow them up, or blast them further into outer space — i.e. out of our orbit? The Chinese military did blow one up but when you blow something up it leaves a lot of debris and makes the problem worse. To get them out of orbit and send them off into outer space requires power, a lot of power, and maybe isn’t the most responsible way forward. When they are brought down most of the satellite burns up on re-entry and only small pieces hit the Earth, so you don’t have to store them anyway. I knew there would be a reason why blowing them up was not an option. There is a company that is producing small lightweight parachutes, about the size of a tissue box that you put into each satellite before launch. Very cheap, they open upon command and slow the machine down so that it returns into the atmosphere slowly and burns up. The only problem is the lack of international regulation in space. The rule is that if you have the technology and the money you can put anything up there, so no enforcement of any grand plan is possible. They have already had to evacuate the international Space Station several times because of pieces passing close by. A small 2 cm piece would penetrate the hull at that speed and mean the end for the entire vessel. Very timely article for me, as the topic came during our discussion on nuclear wastes just yesterday. I’m sure though that none of the satellites are fueled by nukes. So why not force them towards the earth itself? They will burn in the atmosphere, just like other meteors do. Of course, we need to have global consensus and lake of an international regulatory mechanism may be the only solution before anything can be done. I’m sure though that none of the satellites are fueled by nukes. – Now that would be worrying Ken! Hopefully none of our satellites are, as I am pretty sure they could do some rather large damage on re-entry if they were! As we’re caring about our green nature, we should care about space as well. Due to increasing numbers of satelites in space, is creating imbalance which we should consider seriousely and should bring out satelites which has no usage now but still taking digg in space. Earlier the right to govern space was with USA alone but it got a partner as well… “China” ;). We’re doing thousands of experiments with space which is not good at all. Every country should think about it’s negative impacts as well not positives only. And that was exactly my point sir! India is also getting in on the game and so are several of the ex communist countries in Eastern Europe. btw, Aanchal is a common girl’s name in India. Huh… what is the relevancy of this? Oh, sorry. It was a mode of reverence though. 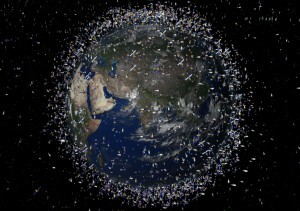 It is a better idea to stick the satellite there on the outer space. Nobody own the space isn’t it? (as far as I am concerned). There are still a lot of things to explore out of the earth. I am not an astronaut unfortunately, but I presume that there is a reason that all of these machines are in similar orbits. Great piece of information Jonny. The race for space territory is probably the reason for these kinds of activities. Governments don’t realize the potential threats of such actions. Quick question : How many nuclear explosions have been there in world history? The answer is just not guessable ! !